A generally peaceful fish that will do well with larger robust community fish. Do not keep with smaller fish as they may be eaten. In the wild, bottom-dwelling invertebrates would make up the mainstay of their diet. In the aquarium, they will accept nearly all live, frozen and dry foods. Feed sinking pellets to ensure that this fish can feed in a natural manner. Feeding Synodontis notatus once or twice a day is sufficient. However, if the fish are too nervous to come out in broad daylight, rather feed once the lights have been switched off, where this catfish will feel more comfortable feeding. These fish are very active feeders and can often be seen after feeding times with very distended stomachs. The tank itself doesn't have to be exceedingly large, although a tank of at least 121.9cm (48") minimum is recommended for adult fish. Length and width of the tank (making up the tank footprint) are more important than height. The substratum should be of a soft and sandy texture - any sharp gravel can harm this fish's barbels which can lead to infection. Darker coloured gravel works much better with this fish, as it shows off the fish much better; lighter gravels tend to mute its colours. Various pieces of rock and wood should be incorporated into the tank to provide hiding places during the day. Provide some caves as well in order to view this fish's occasional upside-down behaviour. This fish will not eat plants but may uproot them while foraging for food in the gravel. This fish is normally only very active during feeding times and once the lights go out, otherwise most of the day is spent resting on tank ornaments or slowly foraging in the substratum. It is not an aggressive fish but will eagerly eat fish fry and very small fish. 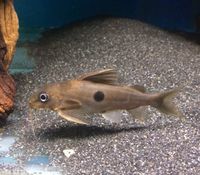 It is compatible with most fish species, and is mostly tolerant of other Synodontis species. However, if the tank is too small, there may be brief chases between the two species, so ensure that both adequate space and hiding places are provided. Feeds primarily off the bottom of the tank; however,they will move up along any decor (such as plants, rocks and wood) up to the midwater level. They have been noted for occasionally feeding off the surface of the water in an upside-down position. The general body colouring and spot pattern on this species makes it easy to tell apart from the other commonly traded species. This fish can have a varied number of spots on either side, or no spots at all. It is very hard to distinguish between hybrids of this species and true S. notatus.